The apartment was very clean. It was adequately equipped which made my stay very comfortable. Felt like home. It also felt safe. The location in Kraków was perfect; very easy to arrange day trips to Wieliczka salt mine and Auschwitz - staff were helpful with this. Clean and spacious, very nice and helpful staff, amazing location. Clean, spacy, comfortable. Good location, close to everything. We used Uber to get everywhere but it is 15 min walk to the old city. Location was perfect. Just a few minute from the old town. Apartment was clean and comfortable. The only complain I have it that we asked the reception to send a maintenance to fix out heater and there was no show. When I called to see when he was coming, they said he already came. Not true. I was in the apartment the entire time and no one came. Basically we had heating in our apartment. Other than that, no complaints. Very friendly staff. Clean, nice location. I would highly recommend staying here. Overall a very nice, modern apartment and felt like home. 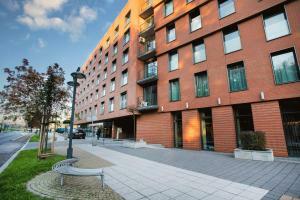 The location was convenient, close to old town and Galeria Krakowska. Lock in a great price for Angel City by Turnau – rated 8.5 by recent guests! 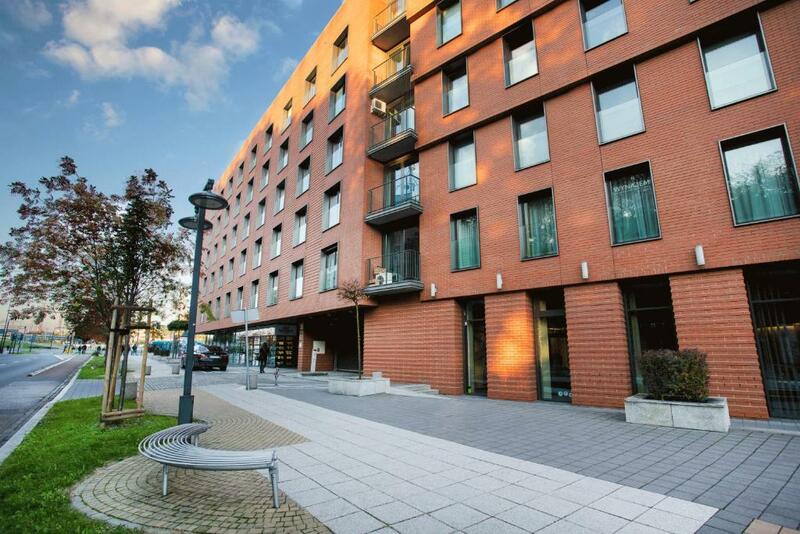 One of our top picks in Krakow.Luxurious apartments Turnau- Angel City Aparthotel are housed in a modern complex in Kraków’s center, 8 minutes’ walk from the Main Railway Station. All offer internet and fully equipped kitchenettes. The apartments at the Turnau- Angel City Aparthotel come with a kitchenette, equipped with a refrigerator, cooker, microwave and all the necessary dishes and kitchen utensils. At the Turnau- Angel City Aparthotel, you will be just 10 minutes’ walk from Kraków’s Main Market Square. Galeria Krakowska Shopping Center is only a few steps away. A restaurant, where guests can have breakfast, can be reached in 2 minutes on foot. When would you like to stay at Angel City by Turnau? 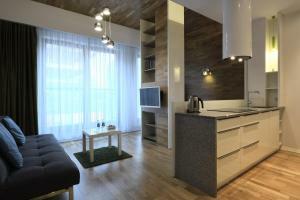 Modern, bright apartment with a flat-screen TV and a bathroom with bath or shower. Public parking is available on site (reservation is needed) and costs PLN 50 per day. Modern apartment with a kitchenette and a bathroom with bath or shower. There is a seating area and a flat-screen TV. Underground parking spot is available at surcharge. This apartment has a kitchenware, sofa and seating area. This suite has a kitchenette, kitchenware and electric kettle. Some of the suites have air-conditioning or terrace or a balcony. This apartment has a dishwasher, sofa and kitchen. The luxury apartments at Turnau – Angel City Aparthotel offer modern, comfortable accommodation in the centre of Kraków. Many tourist attractions and famous landmarks are located within short walking distance. Galeria Krakowska shopping centre is just a few steps away, while the Main Market Square is 500 metres from the property. All of our apartments available for rent in Krakow are located in the centre of the city, or in the neighbourhood adjoining the Market Square. Since 2000 we have been hosting both tourists and business travellers in Krakow. Our long term experience has taught us to reach out to the needs and expectations of our clients in a flexible and personalised way. This approach means our guests return and recommend us to their friends. Our main goal is to ensure you have a pleasant stay in Krakow and that your visit to our city is a unique and unforgettable one. For years we have been gaining our customers' trust and earning the impeccable reputation of being wonderful hosts. Our willingness to listen to the needs and comments of our guests helps us to constantly improve our services. Elegant apartment complex Angel City was built just next to the railway station and Galeria Krakowska shopping center (100m). In just a few minutes you can find the Market Square; close to all of the city sights, shops and banks. Innovative architectural solutions are used in all the buildings. Underground the building there are parking lots for all our guests. Also, we would like to welcome you to our Bistro, where we serve our yummy, delicious breakfast. In the complex there is a gym, hairdresser and plenty of different shops. House Rules Angel City by Turnau takes special requests – add in the next step! All children under 12 years are charged PLN 80 per night for extra beds. Angel City by Turnau accepts these cards and reserves the right to temporarily hold an amount prior to arrival. Keys can be collected in the reception located right next to the main entrance in 77 B2 Szlak Street from 8:00 to 22:00. In case of late check-in please contact the property to arrange for check-in and key collection. Please inform Angel City by Turnau of your expected arrival time in advance. You can use the Special Requests box when booking, or contact the property directly using the contact details in your confirmation. I didn't like the 15:00 check-in. Though you can pay for earlier check-in, I found this to be annoying. Beds! Very uncomfortable. Could do with more than 1 towel each. Excellent locations. Staff very helpful and organised our day trips. First of all there is no short term parking in front of the office and there is no place to leave the car before you get the keys. Bistro was quite small and overcrowded. Kitchen was equipped very purely, but still fine. Place is very noisy due to the main street, we also heard people walking in the hallway. Mattress was extremely soft and the double bed very tiny. Free breakfast delivery to the room. The location is perfect, you are in the city center in 10 minutes walking. Bit cold at times but when the heat went on it was perfect. Extremely clean flawless apartments would recommend they are quality. the room wasn't very warm even with the heater on. the bathroom and the outside view from the room was nice. Great value for money, great sized appartments, clean and staff were helpful. The room is decorated with a bad taste. Olso old fashioned and cheap lookog. I night light cannot be switched off. Bed is too narrow and there was no avalibiliy of a two bed room. The only thing that could have been better was the bed as it was very hard and uncomfortable. Nothing to say. Everything was just fine! Everything was just fine! Great location, clean apartment with all facilities needed. I'd like to especially thank Vitaly (a student from Nikolaev, Ukraine), one of the night staff for his extraordinary help, kindness and worry. Thank you very much!! Breakfast is overcrowded. We had an appartment facing the main street and it was pretty loud. Room service for breakfast with no extra cost! Staff could’ve been more friendly and helpful. Clean and spacious apartment. Perfect for our group.